After a full year and a half of one defendant being on remand in prison, numerous pre-trial hearings and several last minute postponements, the EDO decommissioners’ court case is finally kicked off on Monday. With the first date taking place exactly a week after the murderous attack on the Gaza freedom flotilla, the world has, yet again, been reminded of Israel’s continuous war crimes and much is at stake. A callout for solidarity with the decommissioners during the trial has been issued. There will be an 'If I had a hammer' themed demo in support of the decommissioners outside EDO/ITT on Wednesday 9th June between 4 and 6pm - Bring rubber and inflatable hammers. The decommissioners will be arguing that their action was taken to prevent greater crimes. The trial comes just a few days after 9 people who attempted to decommission Raytheon in Derry during Israel's 2009 assault on Gaza were acquitted by a jury (see Ireland Indymedia and here) . The six decommissioners barricaded themselves inside, and proceeded to break computers and other equipment, with the aim of preventing the factory from being able to produce weapons. The action stopped production at the facility until Israel’s bombing campaign was over. Anti-militarist activists entered the ITT/EDO MBM arms factory in Moulescombe, Brighton in the early hours of this morning, where they are believed to have caused extensive damage to the offices, and to equipment used to make arms, including the 'zero retention force arming units' and 'ejector release unit 151' which the Smash EDO/ITT campaign says are supplied to the Israeli Air Force. The campaign became aware of the action when they received a phone call from those inside the factory this morning who said that they were 'decommissioning' the factory in solidarity with the people of Gaza, who are currently at the receiving end of the factories products. A mass protest against Brighton-based arms manufacturers EDO MBM/ITT took place on 15 October, 2008. Organised by the Smash EDO campaign, the event was called Shut ITT! and was the third such demonstration this year. Last June, Brighton saw the Carnival Against the Arms Trade, organised by Smash EDO too. As the 400-strong march was prevented by police from reaching the EDO factory, 40 bottles of red paint were thrown over the back fence by a group of protesters who split off. The 'bomb factory' was reportedly shut down for the day. At least 10 people were arrested and some injured from police violence, including a photographer. A SHOW of strength by the police is expected by anti-war protesters gathering in Brighton on Wednesday October 15. A mass demo against the South Coast city's weapons factory, EDO-MBM/ITT, is being staged and after the success of the last one, cops are thought to be planning a hardline approach. The movement is growing - in June this year over 600 people came from around the country to the ‘Carnival Against the Arms Trade’. The Carnival managed to reach the Brighton bomb factory despite police attempts to stop it! Police have intervened across the country to censor 'On the Verge' an independent documentary about the Smash EDO campaign to shut down the Brighton's weapons manufacturer EDO MBM. So far establishments in Southampton, Chichester, Bath and Oxford as well as Brighton have come under police pressure to cancel film showings. In Brighton police intervened to prevent a showing at the Duke of York's Cinema, just one hour prior to the scheduled premiere. Using activist, police and CCTV footage plus interviews with those involved in the campaign, 'On The Verge' tells the story of one of the most persistent and imaginative campaigns to emerge out of the UK's anti-war movement and direct action scene. See trailers of the film here(mpg) and here (wmv). A torrent file of the film has also been created. To download a copy of the film and to know how to use bittorrent click here. Spokesman for the production company SchMovies, Steven Bishop said "I am extremely disappointed but not entirely surprised by the police's action. There may be issues with certification but as we're not charging for entry this shouldn't be an issue. If the police really had problems over the certificate they could have approached us at a much earlier stage. Our film although focussing mainly on the rights and wrongs of protest shows a number of examples of questionable police behaviour – Perhaps this is why they left their move so late"
21st April - London. - London Action Resource Center Tour's page for the latest information on screenings. On Tuesday 15 masked activists entered the car park and loading bay of EDO MBM, Brighton warmongers manufacturing arms for the UK, US and Israel blowing claxon horns and sounding sirens to signify that the Smash EDO campaign is not going away until EDO closes down 1 | . View the video of the anonymous demo here . Smash EDO plan to step up their campaign this year with weekly noise demonstrations at the factory, phone blockades, direct action and a week long protest camp this August. 2007 is the year to close EDO down. Campaigners against Brighton arms manufacturers EDO MBM, have made progress in their year-long battle against the company's attempt to silence them with an injunction under the Protection from Harassment Act,1997. At a High Court hearing on Monday 13th february, EDO MBM agreed to drop the provisions of the temporary injunction which affected any individual who wished to protest against the company. Restrictions included a prohibition on filming by protestors, and a designated protest area which was a grass verge across the road from the Moulescombe factory. The verge backed onto a steep drop to a railway line. Over 30 arrests have taken place in the last two years as EDO MBM tried to quell protests. 2 protestors spent a week each on remand in Lewes prison for alleged breach of the injunction. EDO MBM's failure to impose a blanket injunction represents a major victory for the right to protest. The matter is yet to be concluded for 2 campaigners who have declined to sign undertakings, and are determined to challenge the whole manner in which EDO MBM, their lawyer and Sussex police acted together to bring the proceedings. Plans are in place for a 'Victory demonstration' outside the factory on Wednesday March 1st from 4-6pm, and protestors have vowed to carry on with their campaign against the company which makes bomb release mechanisms and is involved in the manufacture of the Hellfire missile. Smash EDO recently held a week long peace camp in the Wild Park behind EDO MBM in Brighton. The Peace Camp came just months after EDO MBM sought a civil injunction under the Protection from Harassment Act aimed to limit protest outside the factory. Smash EDO are a grassroots campaign group who have been trying to shut down Brighton arms manufacturers EDO MBM for over 18 months. EDO MBM manufacture weapons for the US/UK's war on Iraq and to the IDF for their oppression of the Palestinians. Brighton-based arms manufacturer EDO are producing electrical weapons components for the US, UK and Israeli militaries. For over a year, the Smash EDO campaign has been trying to shut them down by direct protest at their premises. Recently, EDO MBM have applied for a High Court injunction to stop all protest at their premises except at designated times. The Smash EDO campaign regards this as a direct attack on freedom of expression and calls for a week-long protest camp, starting with a peace march in Brighton [report]. Update: A legal observer was arrested on the 16th , and has now been released on bail pending a pre-trial review at Brighton Magistrates court on Thursday 23rd June. In a spectacular march through Brighton on Saturday June 11th, 150-200 protestors showed that they would not be intimidated by the violence meted out at the May 31 Big Demo at EDO MBM by Sussex police. After an open mic event on The Level where several protestors spoke out against EDO MBM as well as the draconian Harassment Act interim Injunction brought by the company against peaceful protestors outside their factory, and Sussex Police’s brutality trying to enforce it, the march began. EDO activists in Court again. After their High Court appearance earlier in the month 1, and the adjournment then, 10 EDO activists where again at the High Court on Friday the 22nd of April to have their case heard. 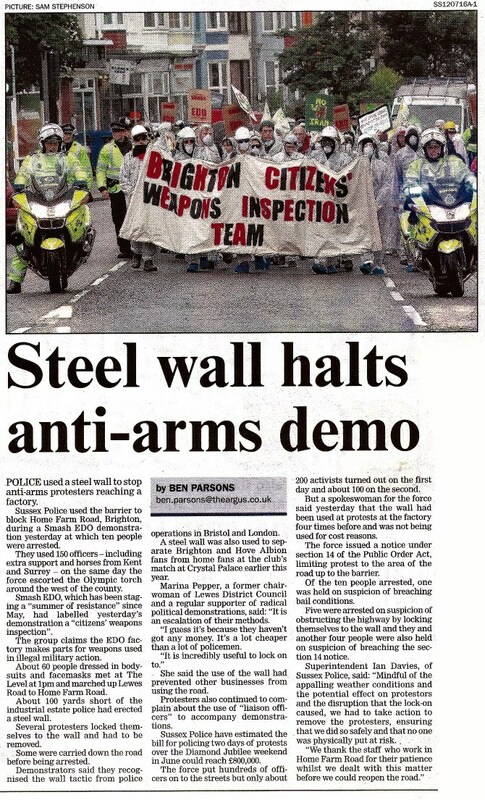 Representatives of the Arms Manufacturer EDO/MBM technologies have sought an injunction to effectively prevent protests outside their premises in Brighton. The proposed injunction would prevent any artificial noise or amplification devices from being in the “exclusion zone”. This effectively amounts to a private corporation buying its own private martial laws enforceable by the police. On 25th March, Smash Edo, Bombs out of Brighton and 14 individuals were issued with intended injunctions under the 1997 Harassment Act, to be heard in the High Court on April 14th. The law was first introduced to protect people from stalkers but was then used against anti-vivisection groups.. This is the first time it has been used against an anti-war or anti-arms trade group.